Home | PARTY SUPPLIES | DECORATIONS | Glowing Dinosaur Toys plastic Figurines, 12 pcs, 5 1/2"
Glowing Dinosaur Toys Figures, 5.5"
Glowing Dinosaur Toys plastic Figurines, 12 pcs, 5 1/2"
Glowing Dinosaurs! 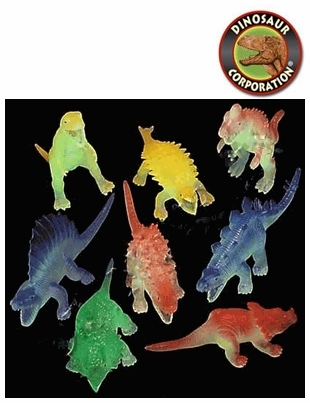 Dinosaurs Figurines Glowing in Dark. These squeezable dinosaur figurines are fun to play with anywhere, but the real fun happens when you turn down the lights and watch them to glow in the dark.